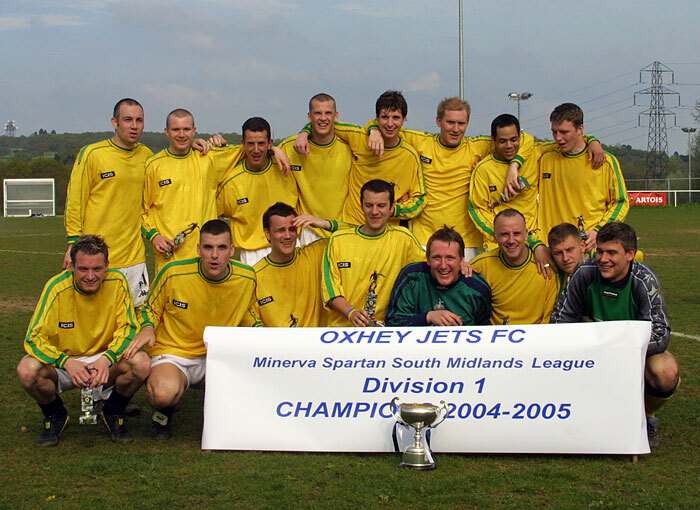 From small beginnings Oxhey Jets have grown steadily over the years and have now been in the Spartan South Midlands Premier since the 2005/06 season. 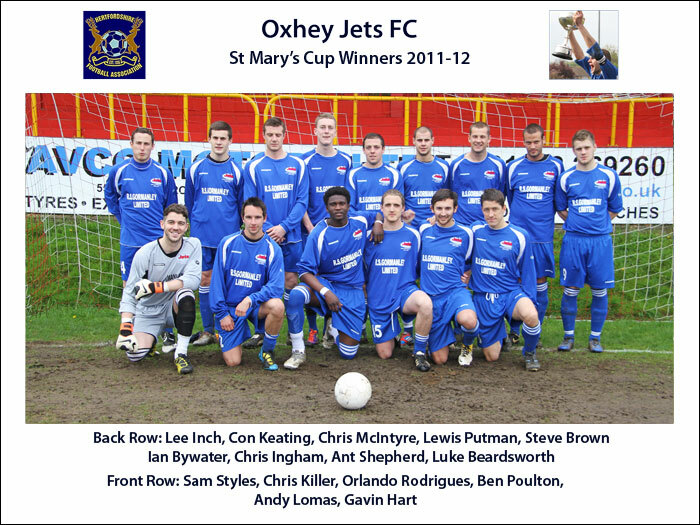 The current General Manager John Elliott founded Oxhey Jets in 1972. Playing their first season as an under 12 team in the South West Herts Youth League, having been playing friendly matches as the 2nd Oxhey Boys Brigade team for two years before that. A winning start in the League Cup Final on the last game of the season saw the club move on, and more youth sides were added to the clubs structure, with the original side moving up through the age groups. In the 1978-79 season the team, having out grown youth football, moved to the Watford and District men’s Saturday league, and at the first attempt won the Division One championship without dropping a point, this prompted an application to the Hertfordshire Senior County League, which was turned down because their home ground was an open playing fields. We instead went into the West Herts Saturday league, and started to prepare the old school pitch at the Chilwell Gardens site ready for another application to join the County League. Chilwell was ready for use and the runners up spot was secured with three matches to spare, and Jets became the first Oxhey side in history to win The Watford Peace Memorial Shield. The Herts Senior County League was increased in size and Oxhey were elected into Division One in 1981 and were promoted to the Premier Division in 1983. The biggest change to happen to the club was in the 2000-2001 season when Jets moved from their old Chilwell Gardens site to a new two million pound complex in Altham Way (using Met Police Bushey for a season). Jets new ground; “The Boundary Stadium” was built to almost Rymans League standard. While the ground was being built, the First team secured their highest ever honour, Premier Division Champions of the Hertfordshire Senior County League, and the reserves finished Champions as well. 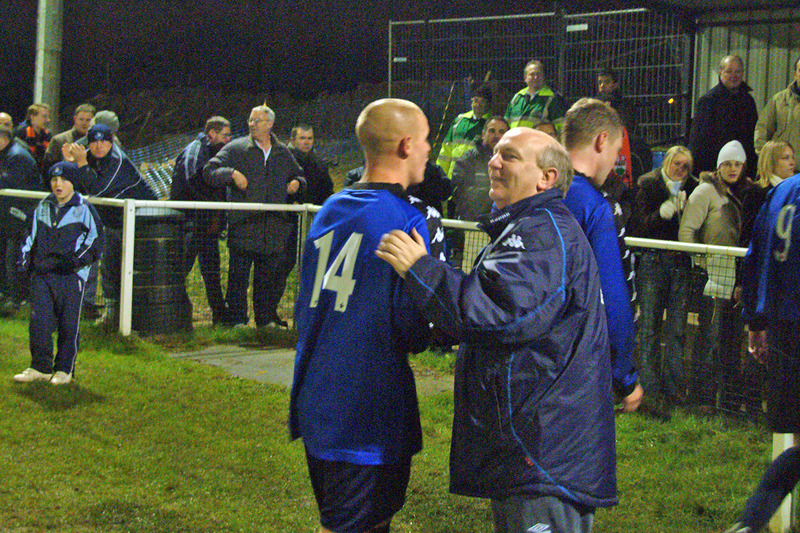 This was to be the start of the best run the club, and County, had ever seen. The following season the first team retained the Championship, while becoming the first team to add the prestigious Aubrey cup and the Hertfordshire Senior Charity County Cup in the same season, the Reserves also retained the championship and added the reserve cup as well to become another first in the County league, winning the double-double. 2002-03 saw the records come tumbling again as all were retained by the first and reserves and the Rickmansworth Charity cup was added to the haul on Easter Monday by the first team for the first time, giving the clean sweep. 2003-04 started with only one aim, promotion to the Minerva South Midlands league, with all the ground improvements complete, the team needed to do the job one more time, as this time the application for the much earn promotion would be made. This aim was achieved as the First team secured a top two place. They also won the Rickmansworth charity cup again and were winners of the highly prestigious St Mary’s Cup. The Reserves retained the World Class Homes Reserve Division one Championship and won the Minerva South Midlands Reserve Floodlight Cup at the first attempt beating holders Dunstable in the final. The 4th team finished runners upin the West Herts League Div 2 and the Sunday team crowned a great season by winning the Marathon Sunday Leagues Charity Cup and were runners up in the League. The 2004-05 season was beyond anybodies dream in the club, the first team winning a treble trophy season. The Minerva Division One Championship was won at the first attempt, winning the division by seven points clear. This was added to the Hertfordshire Centenary Trophy that had been won at the Letchworth County ground in April, beating Hatfield Town 2-0. The triple was sealed in the last game of the season, beating Tring Athletic in the Minerva Floodlight cup final on penalties after a 0-0 aet game. The division one-cup final was lost to Biggleswade. The 2005-06 season, our first in the premier division, saw us finish in 13th place. We entered the FA Cup for the first time and reached the semi-final of the Herts FA Senior Challenge Cup where we lost to Bishop’s Stortford in extra time. Our path to the semi-final gave us our first ever fixture against football league opposition when we met Barnet at home. 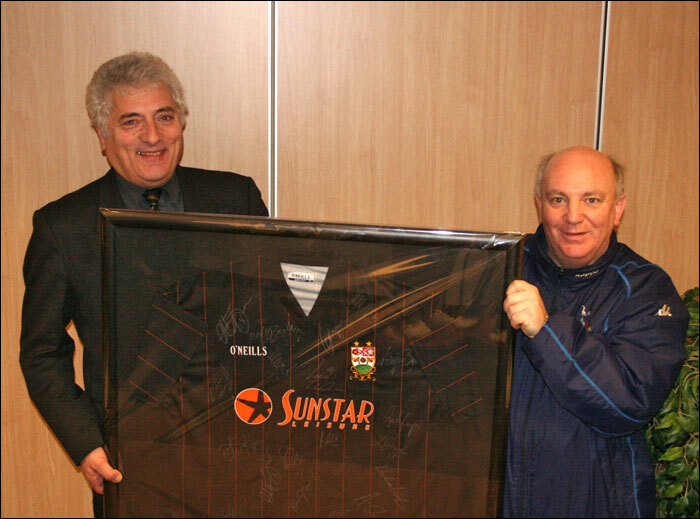 Our 2 – 1 victory was watched by a club record crowd of 257, an event that was marked by a presentation to the club, from Barnet, to commemorate the occasion. The 2006-07 season was without doubt the Clubs best ever season, finishing 7th in the Premier Division and reaching the Premier Division cup final where we lost to Edgware Town by the only goal of a closely fought cup tie. The highlight of the season was in the FA Cup when we visited AFC Wimbledon in the second qualifying round, where despite defeat we all spent an unforgettable day. In the FA Vase we reached the third round proper where we lost at Ipswich Wanderers. Our giant killing act continued in the Herts Senior Challenge Cup when we defeated St. Albans City by 4 goals to 1 before losing, in the next round, to Borehamwood in extra time, after drawing 1 – 1 at the end of normal time. The 2007-08 season was a difficult one for the Club due to the long term injuries suffered by many of the key players. We finished in 19th position in the league and lost to Welwyn Garden City in the Herts FA Charity Shield semi-final. We did however reach the final of the St. Mary’s Cup where we were soundly beaten 5 – 1 by Hemel Hempstead Town from the BGB Football League. The 2008 – 09 season saw us finish in 13th position in the league and we reached the final of the South Midlands Floodlight Cup where we lost by 2 goals to 1 to Royston Town. Our Reserve team finished as champions of Reserve Division 1 which they won by 9 clear points. The Club reached two County Finals during the 2009-10 season. The first being the Intermediate Cup, where the Reserves were beaten 3 – 0 by Hemel Hempstead Town Reserves. Our second visit to The County Ground saw us win the Charity Shield, for the first time, beating St Margaretsbury, by 4 goals to 2. In the League our reserve team retained the Reserve Division 1 title and the first team finished a very creditable 11th following a poor start to the season. We again reached the St. Mary’s cup final, finishing once more as runners-up to Hemel Hempstead Town. The 2010-11 season saw us finish in 19th position, which equalled our worst ever position since joining the league. Our reserves finished as runners-up, losing the league title, which they had held for two years, on the last day of the season. We needed a victory at Crawley Green, but we could only draw with, what was their first team, and Hadley beat us to the title. During the 2011-12 season, as we approached the club’s 40th anniversary, we were once again a successful cup team despite our lowly 17th position finish in the premier division. We were only the second South Midlands side to reach the Herts Senior Challenge Cup Final where we met and were well beaten by Bishops Stortford. 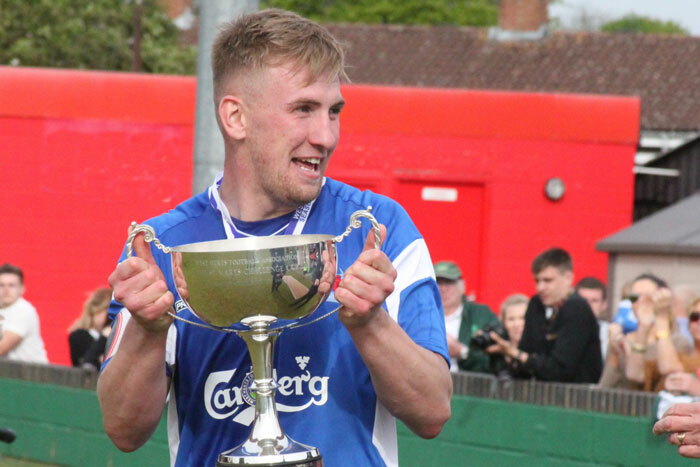 Our second county final saw us beat Kings Langley in the Herts FA Charity Shield to lift the title for the second time in the last three seasons. Our third cup final was The St Mary’s Cup where we again met Hemel Hempstead Town, and the only goal of the game from Andrew Lomas secured victory for us over our old rivals in this competition. During the season we broke our club attendance when a total of 376 supporters watched as we were narrowly beaten by Hendon by 2 goals to 1 in the FA Cup. The 2012-13 season was the clubs most successful league season. Due to the worst weather for many years we finished the last few weeks of the season playing 3 matches each week and the runners-up spot was lost on the last day of the season. We finished in 3rd position behind Aylesbury United and Dunstable Town, who completed the season without losing a league fixture. We retained the Herts FA Charity Shield defeating Hertford Town 4 – 0 in the final, and the last match of the season in mid May saw us beat Cockfosters to win the South Midlands Floodlight Cup. John Elliott receives his BEM for services to the community. 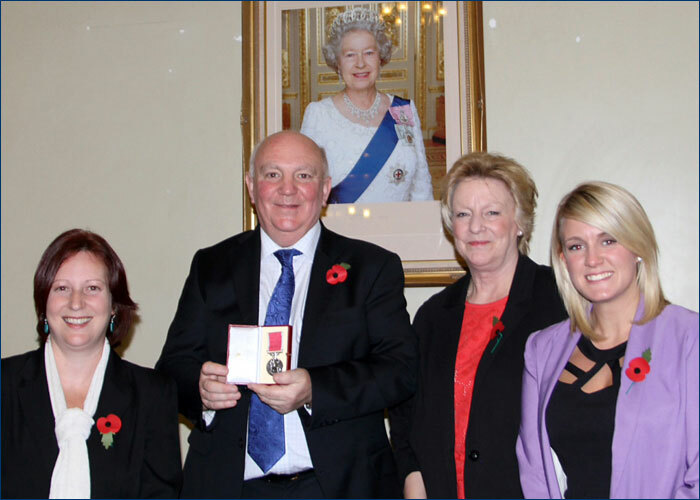 In Her Majesty the Queens 2013 birthday honours list the club founder John Elliott was awarded the British Empire Medal for services to young people and the community in South Oxhey. This was a great and much deserved reward for over 40 years of hard work creating and managing Oxhey Jets Football Club. Website Report here. The start of the 2013-14 season was a difficult one for the Club as we found out that all except three of last season?s team had decided to move to other clubs. With just two weeks to kick off Wayne Gladdy was appointed as manager to try and put a team together.? At the end of January, with just 20 points gained, Wayne started to recruit new players and from then on we only lost one league match which secured our status for the new season. We also reached the final of the St Mary?s Cup where we beat Leverstock Green 3 ? 2. Our reserves finished as runners-up in the Herts FA Intermediate Cup and our Academy team were winners of the Allied Counties East Division.